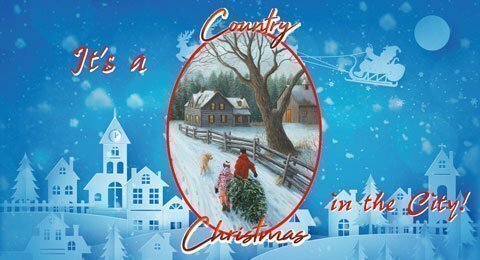 Thursday is Thanksgiving, but only two days later it’s Christmas – a Country Christmas that is, at Osage City. On Saturday, Nov. 24, 2018, the Osage City Chamber of Commerce hosts the annual Christmas on Market Street that officially opens the Christmas shopping season in Osage City. The communitywide event includes a lighted parade and a day full of fun activities and events for all put on by local businesses and organizations. 7-10 a.m. – Kiwanis Breakfast of biscuits and gravy and cinnamon rolls, Osage County Senior Center, 604 Market St. (free will donation). 8 a.m.-3 p.m. – “Sewing Chicks” – Tour the sewing facility and view some of the Chicks’ sewing projects on display; at the senior center. 8:30 a.m. – 5K Jingle Bell Run – Osage City Elementary School parking lot; contact Angie Theel at 785-215-5497. 8:30 a.m.-noon – Pennies for Presents, Bank of Osage City, 913 Market St.; coin grab, exchange for gifts for others. 9 a.m.-11 a.m. – Open house – Landmark National Bank, 102 S. Sixth St.
9 a.m.-2 p.m. – Craft show at 532 Holliday and north end of Santa Fe Depot. To register, contact Janet Bosworth at 785-554-5039. 9 a.m.-2 p.m. – Kids make snowflake ornaments. Osage Hardware, 533 Market St.
9 a.m.-2 p.m. – Retail Poker – Based at the senior center; players visit participating businesses to pick up a free envelope with card. Try to get the best hand for cash prizes. Contact Ronda Harmon at 785-528-3773 for details. 9 a.m.-2 p.m. – 4-H Willing Workers bake sale and hot cocoa. Osage County Fair Association will sell pecans, walnuts, cashews and chocolate covered peanuts. In front of the old Duckwalls. 9 a.m.-4 p.m. – Blizzard Blitz, snowball throw, snacks; Branded Graphics, 530 Market St.
9:30 a.m. – Santa and Elf arrival; Sixth and Market. 10 a.m.-noon – Santa and Elf, visit and photos; senior center. 10 a.m.-noon – Open house and toy expo – McCoy’s, 521 Market St.
10 a.m.-1 p.m. – Pick a Pose – Higher Power Health and Yoga, 627 Market St.
10 a.m.-4 p.m. – Prizes, register for a chance to win – Furniture Loft, 523 Market St.
11 a.m.-1 p.m. – Kids enjoy a free cookie – Subway, 104 W. Market St.
11 a.m.-1 p.m. – Face painting by the Osage City High School Cheerleaders; senior center. 11 a.m.-1 p.m. – Topeka Pilots Ice Hockey Mascot – meet and get a picture, downtown. 11 a.m.-1 p.m. – Free photo booth – take a photo; hosted by Conrad Carlson Charitable Foundation; next to Osage Hardware. 11 a.m. – Luncheon and outside dining court, Sixth Street from Market to Holliday – food vendors will be ready to serve lunch. 12-1 p.m. – Emergency services showcase, at Osage EMS station at Sixth and Main. 12-1:30 p.m. – Fire truck rides, Sixth and Main. 12:30-12:45 p.m. – Ping Pong Drop – Between Market and Main, get a ball with a number on it and visit the corresponding store to collect a gift. 1-1:30 p.m. – Story time at the Osage City Public Library; listen to a story and make a “Country Christmas” tree ornament, 515 Main St.
2:15-2:30 p.m. – Raffle drawing – Sixth and Market. Must be present to win. Tickets will be available day of the event at the senior center and craft show. 2-4 p.m. – Santa and Elf – visit and photos at the senior center. 2-4 p.m. – Gingerbread house building – free, come make a gingerbread house; at American Legion Post No. 198, 115 N. Sixth St. Hosted by Osage City PTA. 2:45-3:45 p.m. – Quarter Bingo – winner takes the pot; at senior center. 4-4:30 p.m. – Chili Cook Off – Judging at senior center; to register, contact Kathy Ayers at 620-340-7972. 4:30-5:30 p.m. – Chili feed; open to all for freewill donation; senior center. 4:30-5:45 p.m. – KC Chiefs Wolf Mascot- downtown; meet and get a picture and autograph. Wolf will also participate in the parade. 5-5:30 p.m. – Parade float judging and lineup; west end of Market Street. 5-5:30 p.m. – Topeka Drum Corps, Sixth and Market; performance and participate in parade. 5:45 p.m. – Downtown holiday lighting – Sixth and Market. 6 p.m. – Christmas lighted parade – Market Street. All individuals and groups welcome to participate, including floats, marching bands, emergency service vehicles, decorated golf carts, ATVs. To register, contact Diane Michael at 785-608-2277.